FTC warns Apple, Android app developers and stores to "wake up", as a study by the FTC (Federal Trade Commission) finds that online app stores are providing almost no information about what information is gathered from children, how it is used, who has access to it and what steps parents can take to keep their children safe. The report found that in 2008, smartphone users could choose from about 600 available apps. Today there are more than 500,000 apps in the Apple App Store and 380,000 in the Android Market. "Consumers have downloaded these apps more than 28 billion times, and young children and teens are increasingly embracing smartphone technology for entertainment and educational purposes" but neither the app stores nor the app developers provide the information parents need to determine what data is being collected from their children, how it is being shared, or who will have access to it, the survey found. "At the FTC, one of our highest priorities is protecting children's privacy, and parents deserve the tools to help them do that," said FTC Chairman Jon Leibowitz. 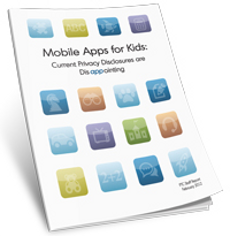 "Companies that operate in the mobile marketplace provide great benefits, but they must step up to the plate and provide easily accessible, basic information, so that parents can make informed decisions about the apps their kids use. "Right now, it is almost impossible to figure out which apps collect data and what they do with it," Leibowitz said. "The kids app ecosystem needs to wake up, and we want to work collaboratively with industry to help ensure parents have the information they need."